one Men's Small and one Men's Large Available. This DASCO professional shoe stretcher is the same quality shoe stretcher that a shoe repairman would use. The stretcher can be used on a left or right shoe. The movable corn or bunion pieces can be inserted into the appropriate holes cut in the forpart, as required. It is called a two way stretcher because it not only will expand the front section width wise but will also lengthen the shoe. Of course it can't lengthen the sole but it can ease out the upper enough to give you some relief if the shoes are too tight. It is easy to use but can take some practice. The instructions are included and also a Ra'lyn Shoe Stretch which is a solution that opens up the pores of the leather and allows the leather to stretch. Made in England. Ra'lyn Shoe Stretch is sold separately too. 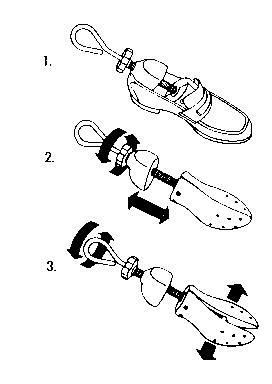 It can help your shoes to stretch while you are walking in them also. Just spray it on while you are wearing your shoes and it will help to stretch the leather while you walk.